Its major export partners are China, the Democratic Republic of the Congo, and South Africa. Its main exports are platinum, cotton, tobacco, gold, and ferroalloys. Its major import partners are South Africa, China, and Zambia. Its major imports include machinery and transport equipment, other manufactures, and chemicals. Located in Southern Africa, Zimbabwe has a 3,229.00 km border with Botswana (834 km), Mozambique (1,402 km), South Africa (230 km) and Zambia (763 km). In 2004, Zimbabwe dropped objections to plans between Botswana and Zambia to build a bridge over the Zambezi River. The capital of Zimbabwe is Harare. It is also the most populated city in the country. Formerly known as Salisbury, Harare enjoys a subtropical highland climate. Zimbabwe is an African country covering 390,757.00 km2 of which 1.00% is water and 386,847.00 km2 is land. The are?includes Perim, Socotra, the former Yemen Arab Republic (YAR or North Yemen), and the former People's Democratic Republic of Yemen (PDRY or South Yemen). This makes it the 60th largest country in the world and about four times the size of Indiana; slightly larger than Montana. Its geographic coordinates are 20 00 S, 30 00 E and Harare is the capital city. It takes its name from the Kingdom of Zimbabwe, which existed from the 13th to the 15th century. Its ISO code is ZW. Zimbabwe has a mean elevation of 961 m above sea level. The climate varies by altitude with a dry season from May to September and a rainy season from November to March. Its terrain mostly consists of high plateaus with mountains in the east. Zimbabwe has a population of 14,546,961 making it the 71st largest in the world. Shona and Ndebele are the most widely spoken languages. The most common ethnic group is reported as African. The majority of the population is Protestant Christian. The number of official languages in Zimbabwe totals 16, though Shona is the most popular language, spoken by nearly 70% of the population. The dialing code for the country is 263. Zimbabwe is an independent country. it gained independence from the United Kingdom in 1980. Its constitution was last ratified in 2013. 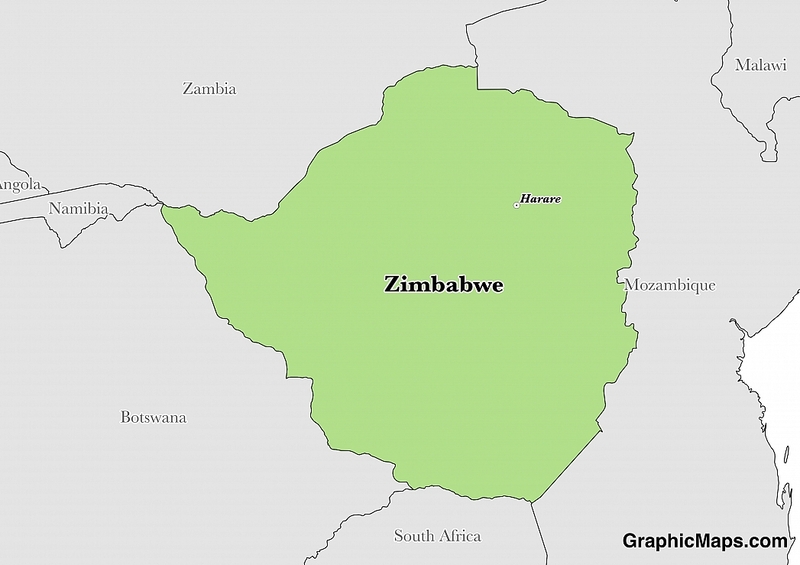 Zimbabwe is found in the Southern part of Africa and is a landlocked country. The government of the country is presidential republic as the president is the head of both the state and the government. The president and the members of parliament have five-year terms, and national elections are held after every five years. The parliament is made up of two houses, the Senate and the House of Assembly. The Senate consists of 80 members, 60 are elected, six from each of the provinces. From the 20 remaining seats; there are two seats reserved for a male and a female representative of people with disabilities. Two other seats are offered to the president of the national council of chiefs and his deputy, and two seats are given to each non-metropolitan district. The House of Assembly consists of 270 members. 210 of the members are elected from the single seat voting regions, and 60 seats are reserved for women representatives. The house of parliament is located in Harare. The country is a single party state with several opposition parties. Factoring in Purchasing Power Parity, Zimbabwe's GDP is $28,330,000,000.00 (USD) with $1,700.00 (USD) per capita. This makes it the 133rd largest economy and its citizens the 205th richest in the world. The currency of Zimbabwe is the Dollar (ZWL). Its major export partners are China, the Democratic Republic of the Congo, and South Africa. Its main exports are platinum, cotton, tobacco, gold, and ferroalloys. Its major import partners are South Africa, China, and Zambia. Its major imports include machinery and transport equipment, other manufactures, and chemicals. The flag of Zimbabwe consists of seven bands of green, yellow, and red colors. Green, red and yellow each occupy several stripes on the flag hence making the bands seven. The hoist side has a white Chevron with a red five-pointed star and a bird. The current flag has been in use since April 18, 1980. Black color on the flag represents the Zimbabweans, and the green color stands for the green nature of the land in Zimbabwe. White color on the triangle stands for peace. Yellow represents the mineral deposits in Zimbabwe while red is a symbol of the blood spilled during the fight for independence. The designer of the original flag of Zimbabwe is not known.